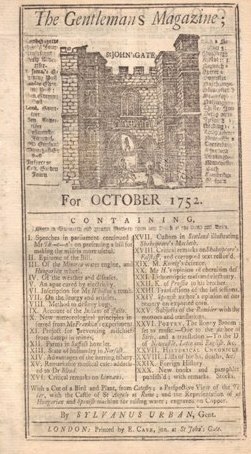 In October 1752 when this issue of Gentleman's Monthly was published Benjamin Franklin's work on electricity was well know because of the May 1750 Gentleman's Magazine article on his discovery of the lightning rod and the 1751 pamphlet published by Edward Cave and translated into many languages (“EXPERIMENTS AND OBSERVATIONS ON ELECTRICITY, MADE AT PHILADELPHIA IN AMERICA, BY MR. BENJAMIN FRANKLIN, AND COMMUNICATED IN SEVERAL LETTERS TO MR. P. COLLINSON, ESQ; OF LONDON, F.R.S.”). Of particular note was the French enthusiasm for Franklin's work which led to the confirmation of his hypothesis. 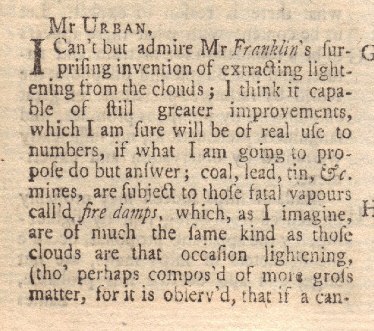 At this time, Franklin's kite experiment with electricity was unknown. The French experiments based on Franklin's work is the subject of the first letter in this issue and the second requests the extension of Franklin's experiments into other areas of inquiry to prevent the explosion of coal gasses in mines and similar mining maladies called "damps in mines." The first article is signed in type by Sunderlandensis who is a clear skeptic of Franklin's work and the French experiments and the second letter, by an admirer of Franklin's work is signed in type by W.C. from Yorkshire. Below are pictures of the start of each of those letters. 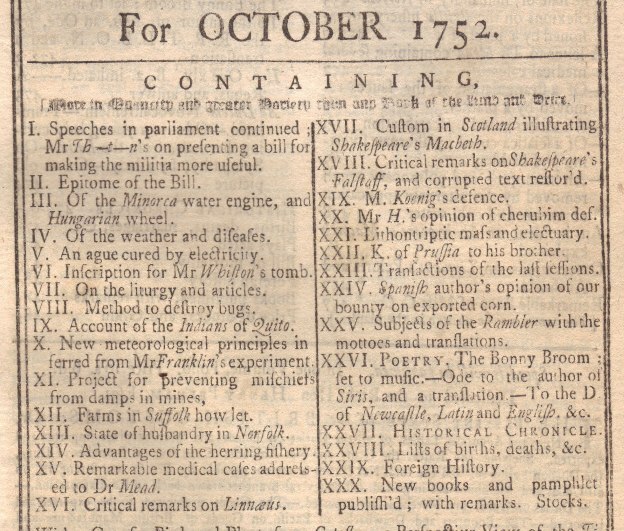 Below is the table of contents for this issue which shows the entry for "New meteorological principles Inferred from Mr. Franklin's experiment." As shown from the index above there were other scientific articles in this issue, a long article on the customs of the Indians of Quito, Ecuador as well as articles on Shakespeare. There is only one plate, a copper engraving of a Minorca water engine and a Hungarian wheel. This issue is very interesting in demonstrating the nature of scientific discovery. 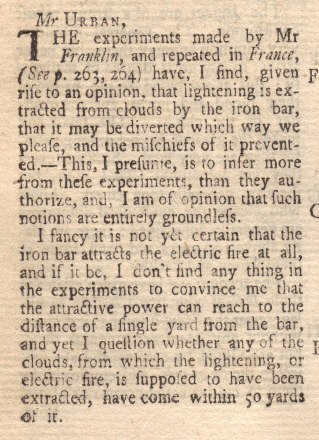 After Franklin's revealed his lightning rod experiments and hypothesis people in other countries began experimenting to test his hypothesis and tried to replicate his experiment. And two years later we still have a divergence of opinion on the validity of the discovery, with one educated commentator skeptical of Franklin's theory and the French experiments validating the theory and another commentator so convinced that he wants the experiments quickly extended to other areas were they will advance human knowledge and safety.